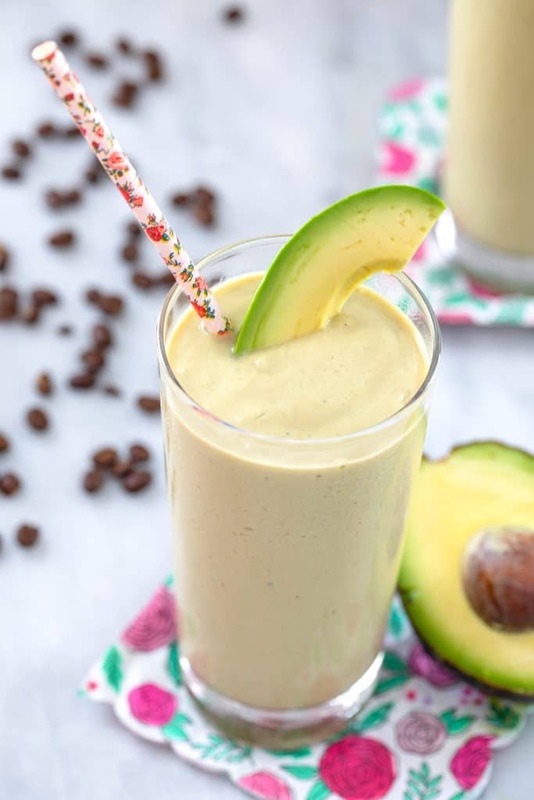 You might think using avocado in a milkshake sounds strange, but this Coffee Avocado Milkshake is the creamiest, most delicious way to get your morning caffeine boost! (This recipe for Coffee Avocado Milkshakes was originally posted in September 2012, but was updated with new photos in 2018). It’s the most wonderful week in the world! Yes, it really is. It’s National Coffee Week, culminating in National Coffee Day on Saturday. I generally always forget to celebrate food holidays on the blog until the day of, but this is one holiday I wasn’t letting pass me by. And now that you’ve had some good notice, you can plan for a National Coffee Day celebration, too. It’s also worth mentioning that National Coffee Day just happens to be on my birthday… Which I think is no coincidence at all and there’s really no other food holiday I’d rather be associated with. Clearly, coffee and I were meant to be. Maybe I was even born with it in my blood. Basically, we’re family. Let’s just go with that, OK? The second Bon Appetit tweeted a link to this recipe, I made up my mind to make it. Coffee. Avocado. Milkshake. Three of my favorite words in the UNIVERSE. Seriously, though; in terms of food/drink, they really are. But yes, I get it. You might be thinking it sounds incredibly weird…. An avocado milkshake?? With coffee?? Just try to stop thinking about it and try it. You’ll be saying “Frappuccino, what?” in no time at all. The coffee avocado milkshake is actually an Indonesian drink, often served over ice, and once you try it, you’ll see why this combo is so popular. 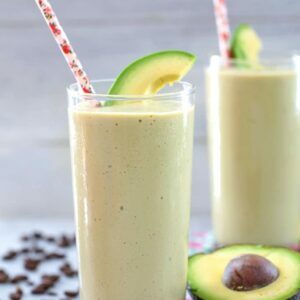 Coffee avocado milkshakes are super easy to prepare; you just put all of the ingredients (cooled coffee, avocado, sweetened condensed milk, vanilla, and ice) in a blender. And then serve in a glass with a little avocado garnish if you so desire. Verdict? Um, yes. I am 100% here for this. The avocado makes this coffee milkshake the creamiest milkshake I’ve ever experienced. And because avocados don’t have a super strong flavor, it was the vanilla and coffee flavors that really shined through in this. 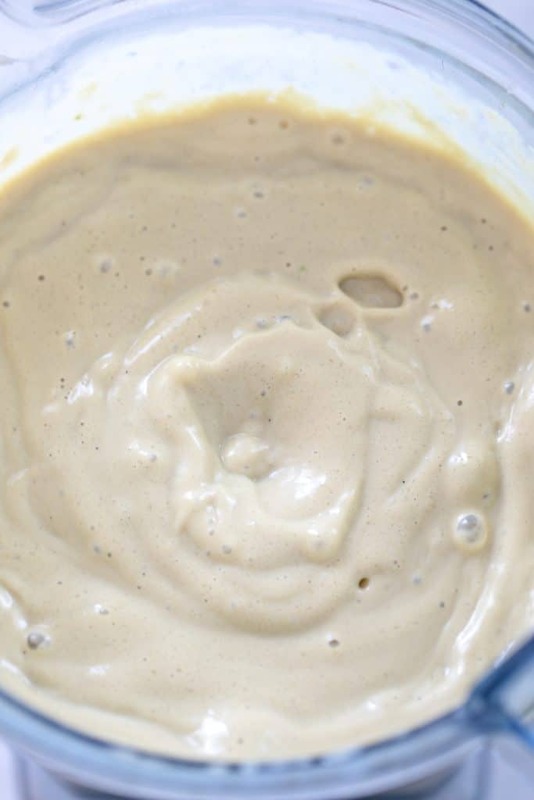 You could also use a flavored coffee if you want say a hazelnut coffee avocado milkshake (note that you may want to cut the vanilla extract if you use a flavored coffee). Don’t get me wrong; coffee avocado milkshakes won’t replace my cup(s) of hot coffee in the morning, but they will certainly be a little treat from time to time… Maybe for when I have a particularly rough day ahead of me or I want to get my weekend off to the right start. Kind of like what I think about Frappuccinos. Though this is one frappuccino-like drink you can feel a little bit better about. While this milkshake is certainly healthier than many of the fat-laden, sugar filled coffee-based drinks on the market, the sweetened condensed milk does still have a good deal of sugar. But think about all those healthy fats from the avocado! 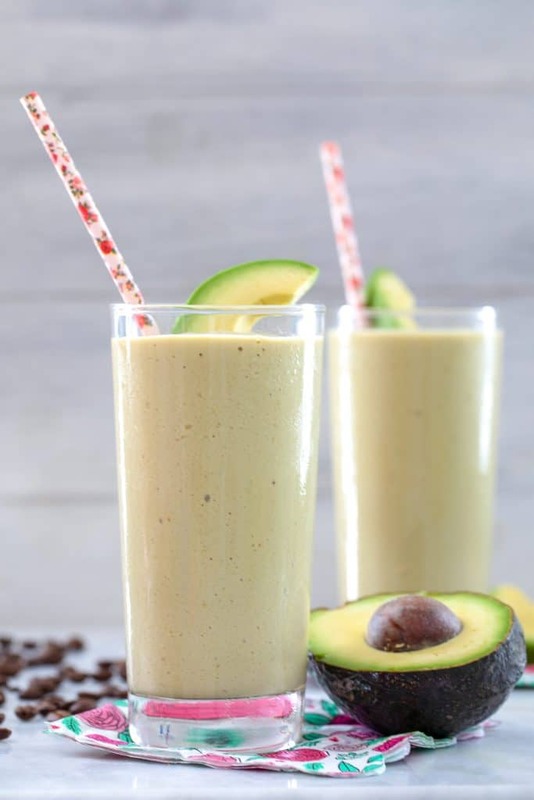 Not that I ever need an excuse for a cup or coffee or to indulge in a delicious avocado, but this coffee avocado milkshake is the perfect way to get your morning jolt, while also sneaking in some nutrients and healthy fats. And not just on National Coffee Day… I’ll happily drink one of these milkshakes any time of the year (but if anyone wants to make me one for my birthday, I wouldn’t turn it down). How many cups of coffee do you drink a day? What’s your favorite coffee “treat”? If you’re looking for some more fun coffee recipes, check out my Caramel Coffee and Doughnuts Milkshake and my Glazed Coffee Chocolate Frosted Donuts. 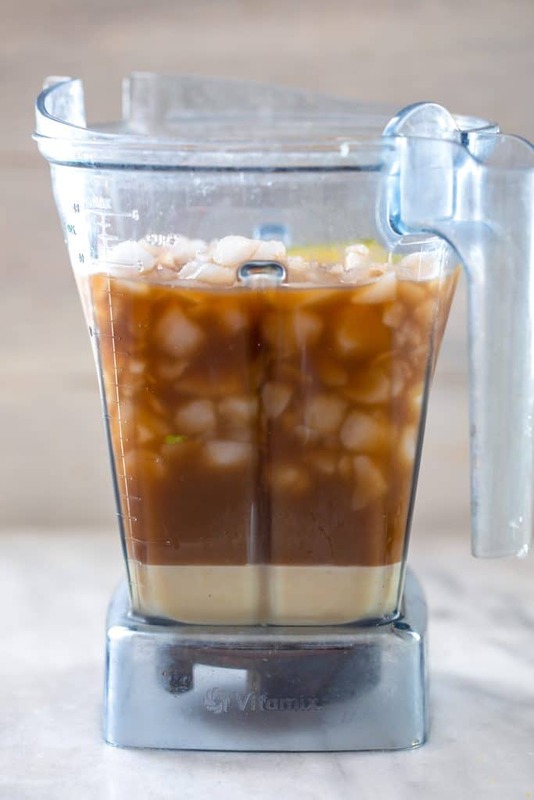 Put avocado, coffee, sweetened condensed milk, vanilla extract, and ice cubes in a blender and blend until smooth. Note that serving size will be smaller than shown in photos when divided among 4 glasses. 141 Responses to "Coffee Avocado Milkshake"
I love coffee but try to drink one reeeally big cup in the morning – you know the ones where you can’t tell if you are drinking out of a cup or a mug. 🙂 sometimes I will treat myself to another cup or a frap from Starbucks later with the hubby. I drink way too much coffee every day. Probably 3-4 big cups. I drink between 7 and 9 cups of coffee a day. Sometimes the whole 12 cup pot. Way too much I know. I would love to win a Keurig! I limit myself to 1 or 2 a day, but I definitely could drink it all day long! I usually drink a cup in the morning, but when it’s fall or summer, I’m all about the flavored coffees… and usually sneak in another. I make a latte at home every morning. Sometimes have a second coffee in the afternoon. Happy Coffee Week! I am a one cup a day kinda person. But if I need an afternoon pick me up, sometimes two. your smoothie looks amazing. I drink at least two cups a day. One in the morning with breakfast, and one after lunch. Sometimes I will have a cup of coffee in the evening after dinner, but that is mostly on the weekends. Usually I drink at least 2 or 3 cups. I absolutely LOVE Keurig! I have had every model including the Cuisinart for Keurig but the Platinum is my favorite. When Keurig frst came out I gave it as gifts for everyone in family and have been a fan ever since. Customer service staff are wonderful. I drink 3-6 K cups, mostly coffee but tea too, a day. Last year I convinced my employer to purchase one. The best! I am a 2 cup person usually. A Keurig would make those 2 cups even better! I drink one – two cups of coffee a day-usually iced! I drink at least 2 cups of coffee every single morning and depending on the day, another 1-2 cups in the afternoon. I drink about 4 cups in a day. And I do have to say, I was both intrigued and slightly grossed out by the coffee/avocado mix. I’m going to try it, because your recipes have never steered me in the wrong direction! I would love to win a Keurig!!! I drink a minimum of 3-4 cups of joe a day!! I drink one very LARGE delicious cup of coffee a day. I drink at least one cup of coffee a day, but i add a shot of espresso to it, when i drink it out. For good measure. hi sues, i’m not a heavy coffee drinker, my little gastritis problem seems not very cooperative with coffee but still drinking it once in a while shouldnt be a big deal. 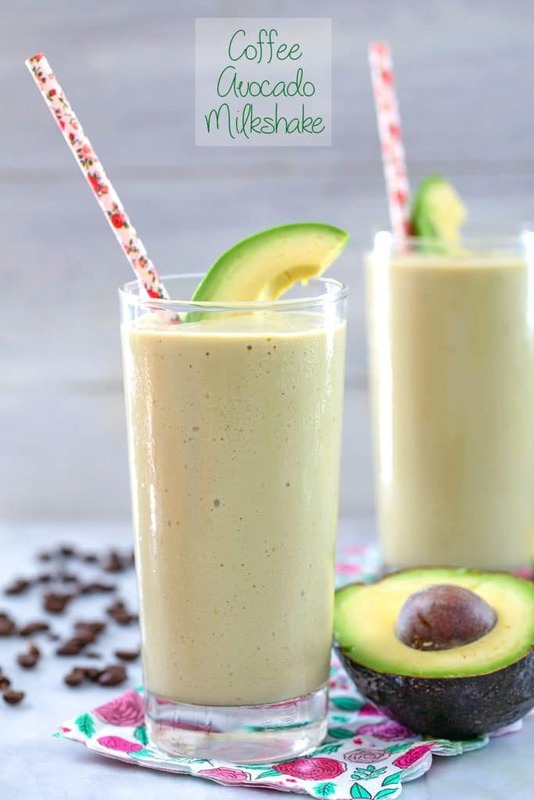 Love your coffee avocado milkshake, it already sounds delicious and rich and creamy to me! Coffee? At least once a day if not two (or three!). Ah, coffee – my favorite subject! I have about 2-3 cups on a regular day, but more if I have to study or go to class after work. Try adding cinnamon to your cup of joe, it’ll blow your mind! I usually like to stick to one cup in the morning; however, as the semester advances I notice a positive correlation between my workload and caffeine consumption. Midterms are next week, so I’m at about 3 cups right now. I tend to make a 4-cup coffeepot full at a time (but not each day), so it averages out to maybe 2 cups a day. If I didn’t have to clean out the filter, it would probably be more! I’m usually a one cup a day person, but living in the land of Starbucks I often pick up a second up while I’m out and about in the afternoon. I always forget to post about these holidays, too, because I find out about them late. I’m intrigued by this shake. I love coffee, and the idea of using avocados in a sweet manner is very interesting. I know the avocado takes on whatever flavor it’s paired with. Very cool. I estimate that I drink up to six cups a day when I have a coffee pot, or 2-3 with a French press. I drink 2+ cups of coffee a day. And by the way, I used to be a strictly Orville Redenbacher kinda gal, but Newman’s makes good popcorn too! i drink 3-4 cups of coffee each day. delicious! At least one cup a day. More if its, “one of those days”. I am cutting down. 1 cup a day — sometimes 1 regular and 1 decaf! I love Keurig! Hi. I am a coffee lover extreme. I drink coffee everyday. I drink coffee throughout the day. A minimal of 3 cups to a max of what is required to get me through my day. Liked you on Facebook and Tweeted about the contest. Thanks for the opportunity! Two cups max. One hot and one iced at work. This milkshake looks incredible! And I normally have one (large) iced coffee a day. I drink at least two cups a day. My hubby is a coffee-aholic though and drinks usually three to four cups a day. 🙂 Love our Java! I have a cup on my (long) T commute to work and then have another cup at work. On the weekends, it’s easy to finish off a pot in the morning while enjoying a late breakfast and taking life a little slower. I definitely have between 2-3 cups of coffee every day, if it’s a realtively calm and quiet day. The longer the day and the more stress, the more coffee! I drink 3 or more per day. I need it to get through my day! what an incredible milkshake! i am loving it! At least a cup a day! I drink about 2 cups a day. 5… At least- and after scrolling through all the other entries feel like that may seem excessive… But I have a 4 month old – and he’s not really sleeping!! I drink 1-2 cups of coffee each day. On an easy day, one cup of coffee will do me just fine. On my days where I’m up at 5 am and in front of a screen all day (today, yikes) it can take up to 4 or 5 cups before I start functioning. Maybe this milkshake will give me a good enough protein kick to not need so much coffee! I drink 1 cup of coffee every day. I drink 1 iced coffee daily and will try to drink tea (Earl Grey at the moment) if I need a hot drink. One cup of coffee, but it is a really big cup. Without it I can’t keep up with my students. I drink 2 cups in the morning, unless I go out and get a treat in town…. but the coffee-maker would be for our volunteer fire department! coffee and avocado sounds like a combination to try! Cool! On a regular day, I drive one cup of coffee while I’m getting ready. Weekends are another story. Yesterday my roommate and I went through two pots of coffee. 2-3. Sometimes 4, but don’t tell. I usually drink two cups of coffee each day! I drink 3 cups of coffee in a day. One in the morning to keep me going for the whole day’s house chores, one in the afternoon for my “me time” and one at night for bonding time with my hubby. I also love avocado milkshake, it’s actually one of my comfort food when I was young. And putting them together would be amazingly delicious. Thanks for the idea! Only 1, but I have a newborn so I could drink it all day! I drink no cups of coffee a day, but I do love coffee ice cream and other coffee flavored treats. I have heard good things about Keurig for hot chocolate and hot apple cider. I usually drink 2-3 cups of coffee a day, but it hasn’t been very appealing while pregnant. I Love Love coffee! I drink 2 1/2 cups per day: 1 at home b4 work, 1 at office in morning and about 1/2 cup in afternoon to keep me going.. btw – I love Avocado too.. I had a taste of avocado every day during pregnancy. I WILL be trying the Coffee Avocado Milkshake-looks yummy! I drink 1 every day – 2 if I really need it! I try to keep it to 2 but there are days that number creeps up! I drink about 2 med/lg per day. I love coffee so much that I drink it black. I got married in January, and one of my top registry items was a Keurig- sadly, it didn’t happen, but I persevered 🙂 I still drink 2 cup a day, with french vanilla Coffee Mate. Also, my husband has been baking your pumpkin pie bars every fall for the last few years, and it’s getting to be that time again- thanks for always adding more pumpkin to my fall! Love your site, have for years. that looks fantastic, although i might make mine sans coffee 😉 i don’t drink it, so please don’t enter me in the giveaway! Love avocado and coffee, never thought to put them together. I usually have one or two cups a day, usually from a Keurig! I love coffee and I love avocado, but together??? It reminds me of the reeces peanut butter commerical. I love chocolate and I love peanut butter, but together. ( google commericial as you are too young for it) Maybe I’ll try this! I drink one cup of coffee at home before work and then pick up a medium iced coffee at dunkin donuts on my way into work. Full on caffeine addict. I usually only have one cup. Unless it’s been a rough day! This recipe looks awesome (I’ll be pinning it right away)! I drink one GYNORM cup in the AM. One, but a big one! I have 2 hot cups in the morning and one large iced in afternoon! I drink 1-2 cups of coffee per day. I love my coffee with chocolate powder, I always keep some on hand. I have 2 cups in the morning, and an occasional cup in the later morning/early afternoon. I can drink a six cup pot of coffee every morning easily, and if I start lagging later in the day I may grab a latte with an extra shot. two large ICED coffees every day! 2-4 cups in the morning. I usually only drink one cup during the day because work keeps me on my feet a lot and I don’t get to enjoy as much as I’d like. However, I still consider myself an addict, because without it, I get major headaches. Good days mean I stick with just one. Crazy hectic day means there is an average of three consumed. I love coffee. One (small cup) a day keeps the sleepies away! Did not become a coffee drinker until I was in my late 50s and now have it every day. Love flavoered coffees. Love Avacado so can’t wait to try this shake. I also liked you on Facebook. i drink 1 cup a day… very very occasionally two, if i stop by a coffee shop later on. There is a McDonalds in my building at work, so I am most often there for Newmans! Also, agreed- the oatmeal they have is pretty good! They had a banana blueberry oatmeal recently, but apparently it was temporary, which is sad, bc it was SO good! 2-3 cups. Usually one in the morning before I go to work and one or two later in the afternoon depending on how much the kids in my class have worn me out! I drink about 2-3 cups of coffee a day 🙂 I brew my coffee every morning (although I set it up the night before) and then sometimes I grab another to keep me going. Oh, I love coffee and I drink about 5 cups a day! Great giveaway! I am a one cup of coffee kinda gal. One or two a day! 1-2 –> I love my coffee! 2 cups a day…sometimes more. I drink 1 cup a day, in the morning… unless it’s a really hectic bad day & then I’ll treat myself to a nice cup of coffee from a local cafe. I drink 2 cups of coffee a day. one extra large coffee in the morning for me! I drink 2 now that I breastfeed but I used to drink up to 5 a day prebaby. I don’t actually drink coffee, but I drink at least two cups of tea a day. 2 cups every day…and you wouldn’t want to be around me if i didnt! I think I need to try this. I didn’t have luck with the lack avocado shake I made. I love this! The avocado really makes it sooooo smooth and creamy, and it fills you up – perfect for breakfast on the go!